For something like the thirtieth day in a row, the weather forecast was for hot and dry. Hot and dry on a blown out track which was taking names throughout the week. This was going to be a good one. A track like this was definitely suited to the Australians, used to racing such dry, dusty conditions. The potential big World Cup names that had been seen around during the week had thinned out, due to Val Di Sole coming up next weekend, and a lot of teams having started the trek back to Italy. Those brave few left had a real fight to get down. In the Women's field, Tracey Hannah topped off the series win, only missing the clean sweep by one second place in Les Gets. Vaea Verbeeck came in behind her, with Emilie Siegenthaler on the third step of the podium. Another Solid result for Emilie Sieganthaler. Tracey Hannah must be stoked with her season. In the Mens race, Troy Brosnan showed off his current form with another first place, standing him in good stead for what might be another dry and dusty World Cup final. 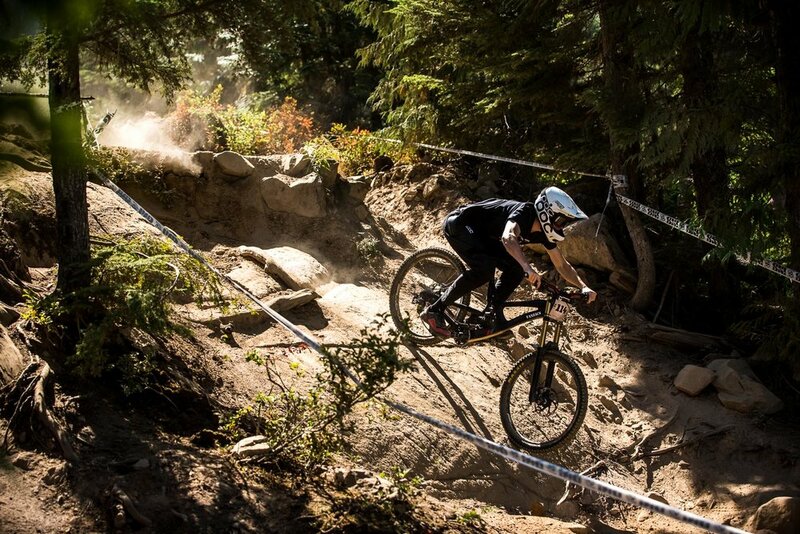 Sam Blenkinsop completed a hat trick of second place finishes this week. He was in the hot seat for a long time, and it was looking good for Sam, even with a minor hiccup in his run, but it was not to be as Troy came through and blitzed the feild by 4 secs. American Bruce Klein took the third place spot, just in front of Jack Moir. Third place KHS factory rider, Bruce Klein. Look at the dust coming off Troys wheels. It was good to see Kiwi Cole Lucas racing, also Peter Bethall who was back from an injury he sustained over in Europe earlier in the season. Rupert Chapman was the second fastest Kiwi on the day. Over in the Amateur race, South Island rider Gareth Burgess took second place in the Senior Men category, and Julie Morris took first in the Senior Women. Cole Lucas, suns out, guns out. Peter Bethall launching out of the shadows. Rupert Chapman, second fastest Kiwi on the day. 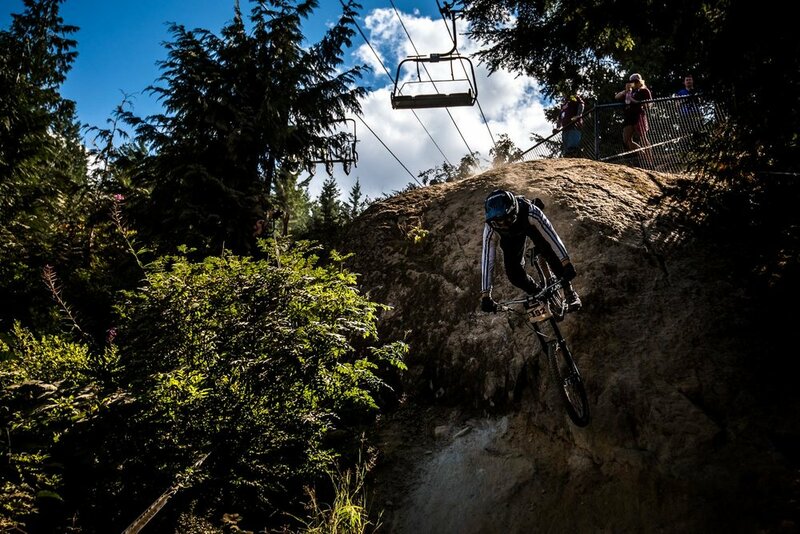 This was the penultimate event here at Crankworx Whistler with only Joyride remaining. There would be celebrating, but many of the riders need to make their way back to Europe. For those that are staying though, it's sure to be a big night. Peter Bethell tackles one of the many rock slabs. Cole Lucas back on track. Jack Moir, so close to another podium. Apparently "it's so itchy" that it might be gone by next time you see him. 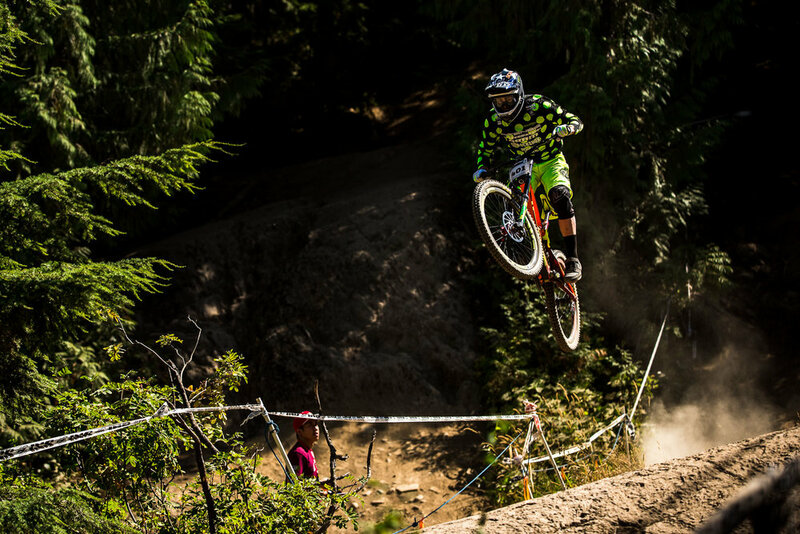 Troy Brosnan and fellow Specialized shredders get sideways on some finely crafted trails.